A wine tour doesn't have to be ordinary. At Avignonesi, one of Italy's oldest wineries, there are plenty of wine-themed activities for couples. You'll have the opportunity to experience everything from private dinners, cooking classes and ferrari tours to flying in a hot air balloon. The 'Wine in the Sky' experience allows you to see the world of wine from a truly unique perspective. This adventure day begins with a 60 minute romantic hot air balloon ride, where you'll soar over the winery and land in the nearby countryside. A car service will take you from here back to the winery, where you'll enjoy a private tour of the Avignonesi vineyards and cellars. To finish this romantic experience, an exclusive brunch is prepared by their winery chefs and accompanied with five premium Avignonesi wines, including the famous Avignonesi Vin Santo. Once a monastery, Badia a Coltibuono has evolved into a production estate of wine and olive oil, among other produce. The historical location offers a selection of wine experiences, and its 'vineyard picnic' activity is a great foundation for a romantic afternoon. This experience involves a visit to the abbey (tasting two different wines), and a transfer from Badia a Coltibuono to the production winery of Monti in Chianti by car. 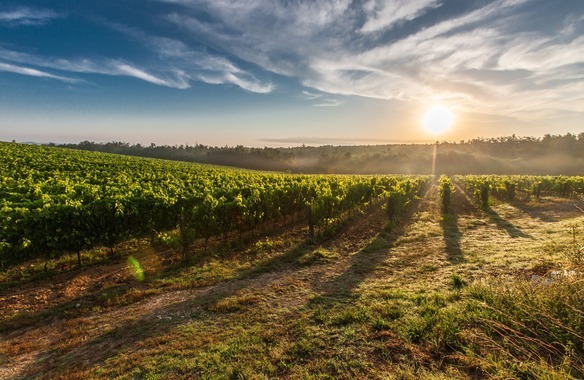 You'll visit the Badia a Coltibuono winery, walk through the vineyards and enjoy a picnic served under an oak tree, all whilst admiring the rolling hills of Chianti. There's nothing more romantic than toasting a fine glass of wine to the Tuscan countryside. This activity is available from April to October, and lasts approximately four hours. Barone Ricasoli is Italy's oldest wine estate, and was the birthplace of Chianti wine. The Ricasoli family opens the gate of Brolio castle for a variety of wine experiences, from private wine-tasting sessions to tours and gourmet dinners. For a romantic wine tasting experience like no other, start the day with a wine tasting in the Wine Shop (located near the Ricasoli cellars) before venturing out into the castle gardens. Enjoy the charming walk through these manicured grounds, and drink in the history of winemaking. You can also have a guided tour of the Ricasoli Collection, located within the castle keep for an extra cost. This experience is open everyday between 10:00 am to 6:00 pm from mid-March to October. Visiting a winery in Tuscany is about more than just sampling the wine, and for a romantic idea, taking part in a cookery class together can make for a memorable experience. You'll learn about the traditional recipes of the region, and have a unique opportunity for some quality time acquiring a new skill as a pair. Capezzana, whose winemakers first introduced Cabernet Sauvignon to its blends, is the flagship property of Carmignano and has a wide selection of wines to try. There are varied experiences at this winery including classic tours and gourmet dinners, but their professional cooking class is the one to book. Founded in the 1980s, these classes are held throughout the year (with a two-week hiatus in August) in both daily and weekly sessions, and there's even the option to take part in a course over two/three days. For an unforgettable experience, this Tuscan cooking class will enable you to learn the art of the region's rich cuisine in one of the historic locations, that give Tuscany its famous reputation. Touring a vineyard is one of the most romantic ways imaginable to enjoy a walk as a couple. 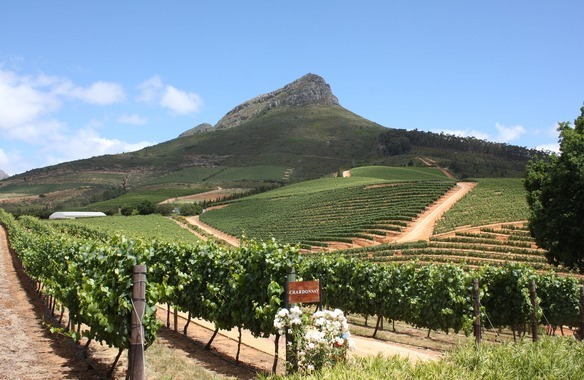 To make this experience even better, you could visit the vineyard acclaimed as one of the top estates in the region. 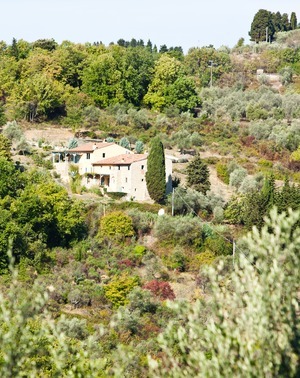 Castellare di Castellina made its name with numerous top-of-the-range wines, including I Sodi di S. Niccolò, Chianti Classicos, and Vin Santos. Located in the Chianti Classico region and covering 80 hectares, this vineyard offers customised tours and masses of space to have a picnic. The natural amphitheater location has unforgettable views that add a little extra romance into your walk. As the main Italian wine importers to the U.S, Banfi, the family owned vineyard estate is located in the Brunello region, and produces a variety wines. In 1978, they became vintners, purchasing land across Tuscany and Montalcino. Today, their wine empire covers an entire district, and surrounds a medieval castle called Castello Banfi. The attraction provides a variety of tasting opportunities for their best wines, a selection of restaurants, a Balsameria and a glass museum. Founded by the Ferragamo family, Castigion del Bosco is a luxury resort in the region of Montalcino's Val d'Orcia. Located across 500 acres, the land has undergone significant regeneration and now includes a winery, restaurants (which use the estate's own produce), a spa and an 18 hole golf course. On your visit, there are few better couples activities than visiting their spa. The Spa at Rosewood Castiglion del Bosco is located in the estates former wine cellars, in the heart of Borgo. Their range of facilities will help you relax in style: with a steam bath, sauna, private gardens, baths, exclusive treatments and a relaxation area all available. This spa takes an holistic approach, and promotes complete well-being with a range of treatments. Enjoy everything from body massages, facial treatments and rituals to signature treatments and manicures. Once the pair of you are fully relaxed, head over to lounge by the pool, or dine at the finest selection of restaurants on site. The spa is open daily from 11am to 8pm, and makes for the perfect romantic stop on your Tuscan adventure. The Colombini family have been producing wine in Montalcino for some 700 years, with products including Brunello and Morellino di Scansanos, two of the region's best. This hilltop winery is home to the Brunello Museum, dedicated to the family and the wines of Montalcino. Whether you enjoy absorbing some history, or love learning more about the drink itself, a trip to this museum is worth the visit. Afterwards, you can experience one of the wine tastings and dine at the onsite restaurant. Tuscany is also renowned for its famous truffles, which are frequently used in some of the finest Italian dishes. At Ruffino, one of the larger and renowned Chianti producers, you're able to enjoy an afternoon of truffle hunting with the professionals. They'll take you and your partner on a tour through the Chianti hills, hunting with a 'truffle searcher' dog in tow. Once the tour is completed, you'll be taken back to Poggio Casciano estate and will receive a truffle infused dinner (using the truffles found) with the top Ruffino wines. The tour is open from 9am to 3pm, Monday-Friday. Located in the heart of the Chianti Classico area, this medieval castle hosts a selection of tours. For something a little different, every Wednesday at 6.15pm they host Baron Littifredo's Wednesday evening Tuscan Family Banquet. This event is held in honour of Baron Littifredo, Lord of Vicchiomaggio in 994 A.D. The evening commences with a tour of the castle gardens and then a visit to the cellars, where you'll learn about the fermentation and maturation process. For an added romantic factor, the tour is followed by an aperitif in the courtyard and then a delicious four course meal of traditional Tuscan cuisine, served in the main banquet hall with three of the best wines. Nothing can quite compare to an Italian romantic adventure than a four-hour round-trip tour in the vintage Fiat 500, from Florence to the Tuscan hills. Fiat 500s were first introduced to the country towards the end of the 1950s, and soon became the nation's favourite car. This tour offers the opportunity for a romantic drive, beginning at Via Gherado Silvani, a private car park in Florence where you'll meet your guide. You'll then leave the charming streets of Florence behind and head for the Tuscan hills, where your guide will inform you about the region. After two hours of driving in the Tuscan and Chianti landscape, you'll arrive at the 15th century Renaissance villa and wine estate, where the wine tasting and lunch will commence.